Eagle Stainless Tubing & Fabrication utilizes the latest technology to create unparalleled, state-of-the-art solutions for our customers. You'll be amazed at what we can create together! 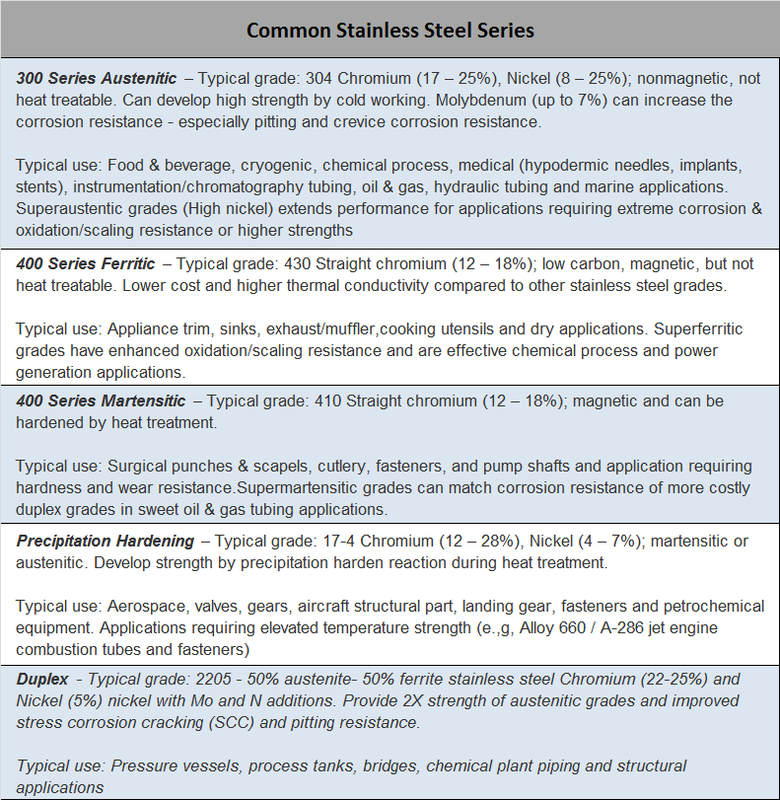 Common stainless steel series with typical grade and applications. Selecting the best alloy for a tubing application can be a daunting task considering the wide variety of stainless steel and metal alloys available. The chromium in stainless steel forms a coherent passive oxide film and oxygen barrier, which imparts corrosion resistance. All stainless steels contain at least 10.5 percent chromium, although most grades contain at least 12 percent to maintain passivity. Understanding the different alloy series can aid in material selection. Austenitic, ferritic, martensitic, precipitation hardening (PH) and duplex are the main series of stainless steel alloys. The austenitic 300 series of stainless steel alloys contain nickel additions as well as chromium, which improves ductility and retains an austenitic crystal structure in the alloy even at room temperature. The 304 and 316 grades are the most widely used. 304 stainless steels nominally contain 18 percent chromium and 8 percent nickel. 316 stainless steels contain approximately 16 percent chromium, 10 percent nickel and 2 percent molybdenum. The molybdenum additions make the chromium oxide film denser, which enhances passivity and improves pitting and crevice corrosion resistance in chloride and marine environments. Ferritic and martensitic 400 series stainless steels do not contain the nickel additions, so an austenitic structure is not retained at room temperature. The absence of nickel reduces material cost. Austenitic and ferritic stainless steels have low carbon levels that are not hardenable by heat treating. Austenitic and ferritic stainless steels can be work hardened through mechanical processing to partial or full hard tempers. Austenitic stainless steels have superior corrosion resistance compared to ferritic and martensitic grades, especially in wet environments. Ferritic stainless steels are easy to form, with sufficient corrosion resistance for dry applications. Martensitic grades have higher carbon levels (1.2 percent in 410), so these alloys can be quenched and tempered to high hardness, strength and toughness levels. PH steels can provide corrosion resistance similar to austenitic steels but with higher tensile strength. Duplex stainless steel grades contain both ferrite and austenite. They have superior chloride stress corrosion cracking (SCC) and pitting resistance with about twice the strength of austenitic grades. 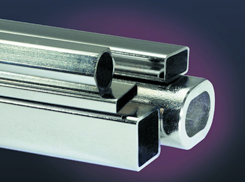 Mainstream stainless steel alloys may not have the required properties for special applications. Highly alloyed superaustenitic, superferritic and superduplex stainless steels are available with enhanced properties for extremely demanding applications. For medical implants, titanium tubing has superior biocompatibility. In certain high temperature, extreme corrosion and wear applications, cobalt- or nickel-based alloys might be the only viable options. Copper-nickel or Monel® tubing is useful in desalination and marine applications. Aluminum tubing might be the best option where high thermal conductivity or lightweight components are required. Identifying the environmental, thermal and mechanical performance requirements is the first step in selection, in order to determine what material properties are needed for reliable service throughout the tubing component’s lifetime. From the material property constraints, a group of candidate tubing materials can be formed. Thermal, mechanical and environment performance needs determine the viable alloy options in many critical tubing applications. Austenitic 304 and 316 stainless steels are considered biocompatible-, surgical- or medical-grade stainless steels. 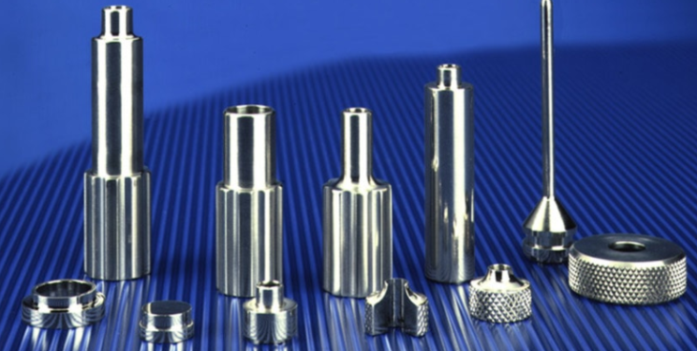 Austenitic stainless steels are suitable for implants, cannula, stents, catheters or medical devices with long-term exposure to blood or human tissue. Martensitic grades are useful for surgical punches, scalpels and medical instruments that must retain sharp edges. These grades cannot match the corrosion resistance of implant grade austenitic stainless steels. In pharmaceutical, power generation and chemical process applications, austenitic stainless steels like 304 are typically the first choice. Certain critical petroleum, chemical process and marine applications with corrosive chloride gas media require the improved pitting and crevice corrosion resistance of 316 or even 317 grade molybdenum-modified stainless steels. SCC can occur if the tubing component is highly stressed while exposed to a corrosive media. Duplex, superaustenitic and high nickel (30 percent) stainless steel might be warranted for their SCC resistance in these applications. Stainless medical components manufactured from stainless steel tubing. High-temperature oxidation and scaling in power generation, refineries, furnaces, jet engines and chemical process plants is another performance challenge. Several stainless grades with high nickel and chromium additions have been developed for improved oxidation and scaling resistance at elevated temperatures, such as 309, 310, 321, 314, 330 and 446. Inconel® and Nimonic® superalloys are valuable for tubing within a jet engine, turbocharger or power generation gas turbine. Aluminum and copper tubing are useful materials in condensers, heat exchangers, radiators, heat pumps and other heat transfer applications due to their high-thermal conductivities as compared to austenitic stainless steel, provided the gas or liquid is not corrosive to these metals. If the media is above 400 degrees Fahrenheit (200 degrees Celsius) aluminum starts to lose its strength. Copper-nickel alloys, while costly, can handle higher temperatures. 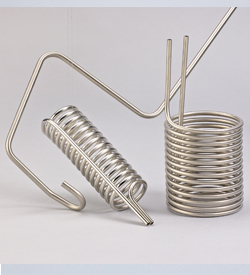 Bending and coiling can provide optimized thin walled tubing constructions for heat transfer applications. In some applications, tubing is required to carry liquefied gases at cryogenic temperatures down to minus 269 degrees Celsius. Aircraft tubing may transfer cryogenic sensor coolants, supercooled jet fuel or liquid oxygen in a rocket engine. Austenitic stainless steels and some aluminum alloys are suitable for cryogenic service because they have no ductile-to-brittle transition and they maintain their properties at low temperatures. Austenitic grades are more prevalent in cryogenic applications because certain aluminum alloys decrease in ductility with temperature. Aluminum alloys 5083 show a 30-40 percent increase in strength and 60-100 percent increase in ductility at minus 195 degrees Celsius, so cryogenic natural gas heat exchangers often use spiral or coil wound 5083 aluminum tubing. For hydraulic tubing, high-pressure tubing, structural tubing or highly stressed tubing components, the mechanical properties are primary factors in selecting a material. The alloy’s strength, modulus and toughness must resist the applied stresses. Stainless steels can have higher strengths compared to aluminum of the same size and thickness, and can easily handle high-pressure fluids. However, the density of aluminum is one-third of stainless steel. 6000 and 7000 series alloys can be heat treated to higher specific strengths (strength/density) compared to annealed 304, which can result in weight savings in aerospace and automotive structural tubing applications. 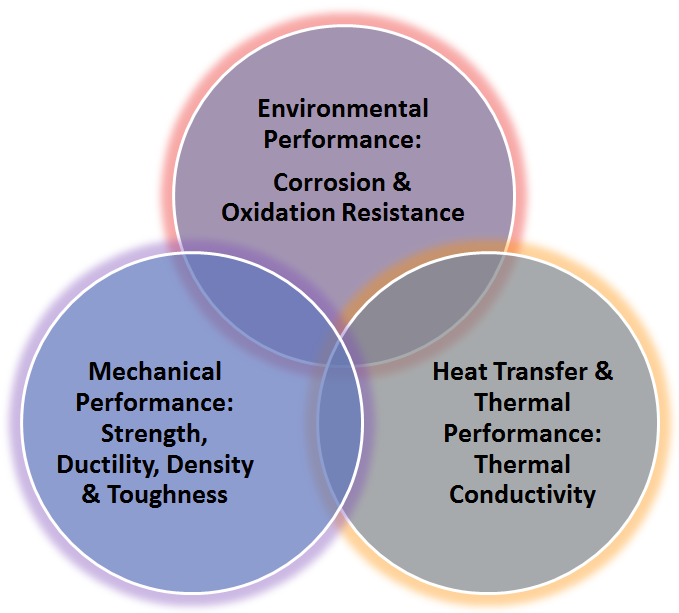 Stainless steels strengthened by work hardening or heat treatment can also develop high specific strengths. Square, rectangular and round shaped structural tubes are important in aerospace automotive and industrial applications. Austenitic stainless steels often represent the best starting point for instrumentation, medical, HPLC, capillary, microfluidic, hydraulic, control and critical tubing applications. Eagle Stainless Tube and Fabrication provides a lab sample kit of hypodermic-grade, fully hard #3 temper, 304 stainless tubing with a variety of tubing sizes (3 to 33 gauges) and wall thicknesses. Design engineers as well as biomedical and laboratory researchers will find the 304 stainless steel tubing sample kit very useful for prototyping and testing new products and instruments. The final material chosen will depend on cost, availability and fabrication factors. The bending, end forming and flaring, laser drilling and cutting and machining capabilities at Eagle Stainless Tube and Fabrication routinely transform stainless steel tubing into a multitude of finished parts for many medical and critical applications.